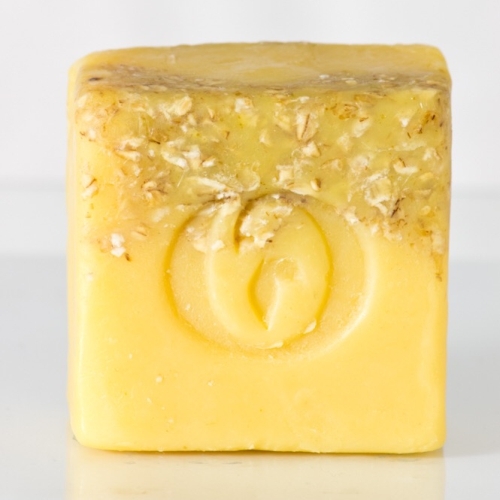 Our Turmeric cleansing bar is a gently exfoliating facial cleansing bar loaded with tons of amazing skin properties. Turmeric is a traditional beauty pillar in ancient Ayurvedic beauty practices. Turmeric restores glow to skin, and aside from adding an enviable glow it is antiseptic and antibacterial, too. Turmeric is packed full of antioxidants and it rejuvenates skin. The bar is also enhanced with oatmeal to achieve gentle exfoliation, which sheds old skin cells and creates a "clean canvas" for skin to better absorb product. Carrot extract, an active ingredient, is packed full of vitamins A, C, and E.
Our natural cleansing bars are natural, and are free of artificial colouring and parfum. All colour and odour is achieved using organic extracts. Our bars are pH balanced, and highly moisturising and are free of mineral oils or petroleum by-products. Notify me when Brightening Turmeric Facial Cleansing Bar Brightening Turmeric Facial Cleansing Bar ~200g is available.